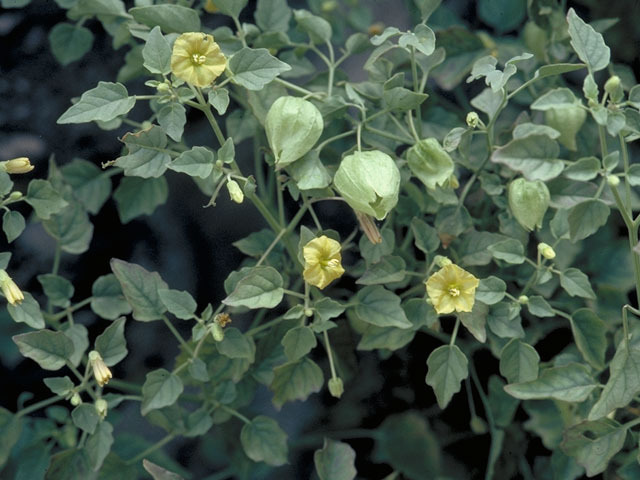 Clammy ground cherry is native to North America. 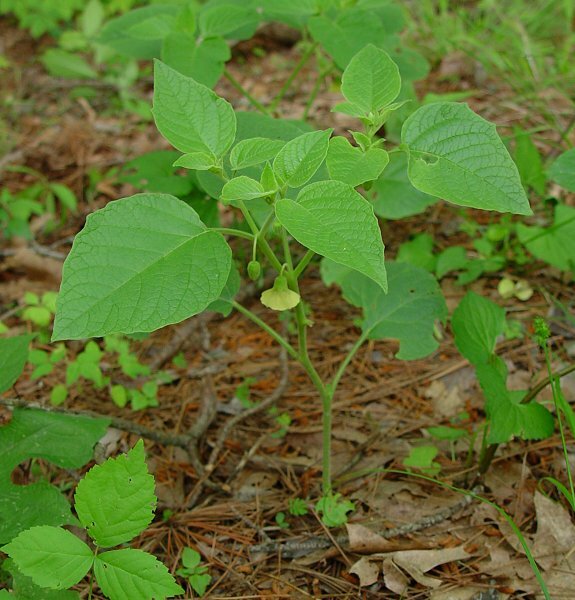 It is found growing primarily in the eastern United States and Canada. It is known to occur in all contiguous states except for Nevada and California. It is found mainly in habitats such as dry or mesic prairies, gravel hills and rises, sandy or rocky soils, and waste ground thickets etc. Evergreen perennial 45-75 cm tall, branching frequently; stems usually round and covered with white hairs. Leaves whitish or yellowish green, up to 10 cm long and 8 cm across, cordate or broadly lanceolate, with a well-rounded base, margins horizontally wavy and irregular, often vertically undulate as well; leaves and petioles finely pubescent having a rather soft texture. Flowers solitary, drooping, 2 cm wide; pedicels 5 mm; calyx with triangular teeh, pubescent; corolla tubular, pale yellow, divided into 5 shallow lobes with 5 brownish purple splotches near the base; anthers 5, prominent, dull yellow. Fruits husked which is inititally green and turning brown at maturity; fruits spherical, 1-1.5 cm wide, yello at maturity. Seeds very small, elliptical and granular, light brown and numerous. The fruits are edible and are eaten raw. These can also be made into a jam. 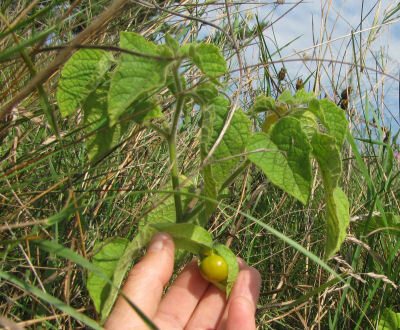 Clammy ground cherry plants seem to have a preference for locations that receive full or partial sun. The soil should contain enough of loam, sand, or gravel. The soil should preferably be rich. Though it is a fairly drought tolerant plant, yet irrigation will be helpful.